This band is a classy and stylish design reminiscent of the plain silver, gold, or platinum rings others buy spending a huge amount of money on a alternative metal that may warp, bend, crush, or even break in extreme circumstances. This ring at 5mm in width allows more room around the finger for those who might use their hands and fingers quite a bit while working. One of the features is that it will never need polishing due to its tungsten carbide composition, and it will not scratch or tarnish. 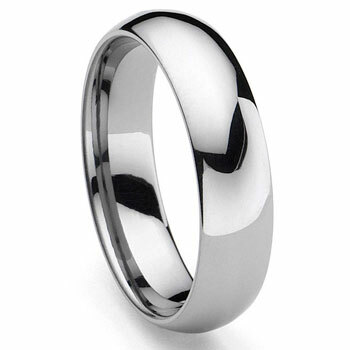 Our tungsten wedding bands are also hypoallergenic so that anyone can wear them without any fear of a skin rash.